In any conflict, it is usually believed that there are two alternatives – the first being the personal alternative and the second being the other person’s alternative. It always comes down to an argument as to whose way is better among the two. 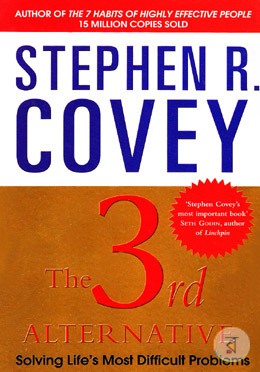 But Stephen, in this book, attempts to introduce readers to a third alternative, which draws the best from both sides of a debate and ignore the negatives from both the parties. It helps in the emergence of a whole new place from a mere debate, where everyone is a winner and the conflict is also resolved. The 3rd Alternative signifies a completely new way of thinking that will be incorporated not only by his ardent fans, but also by anyone who seeks resolution in their professional and private lives. About Stephen R. Covey Stephen Richards Covey was an American writer, businessman, trainer and keynote speaker. He has also written: First Things First, Principle-Centered Leadership, The Seven Habits of Highly Effective Families, The 8th Habit, and The Leader In Me — How Schools and Parents Around the World are Inspiring Greatness, One Child at a Time. A graduate of the University of Utah, Covey obtained his MBA from Harvard University and his Doctorate of Religious Education from Brigham Young University. A Phi Beta Kappa fraternity member, he was a professor at the Jon M. Huntsman School of Business at Utah State University at the time of his death. Stephen Richards Covey (October 24, 1932 – July 16, 2012) was an American educator, author, businessman, and keynote speaker. His most popular book was The 7 Habits of Highly Effective People. His other books include First Things First, Principle-Centered Leadership, The 7 Habits of Highly Effective Families, The 8th Habit, and The Leader In Me — How Schools and Parents Around the World Are Inspiring Greatness, One Child at a Time. He was a professor at the Jon M. Huntsman School of Business at Utah State University at the time of his death.